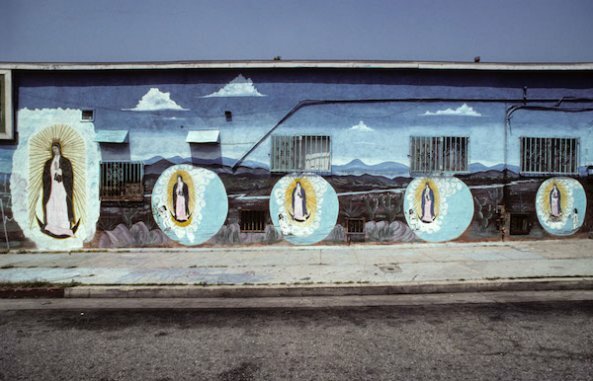 El Toro Meat Market, 3171 Cesar Chavez, Los Angeles, 2001, Manuel G. Cruz, artist. El Toro Meat Market, 3171 Cesar Chavez, Los Angeles, 2004, Manuel G. Cruz, artist. 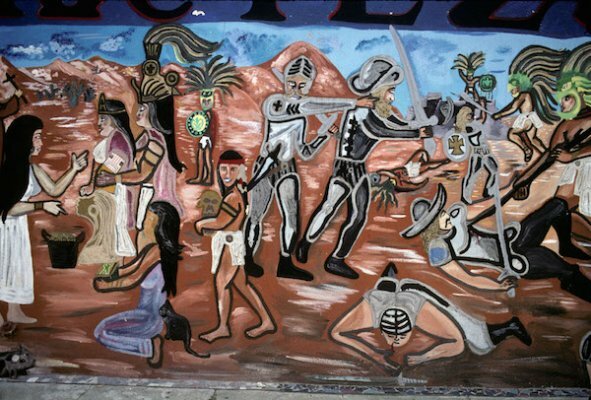 El Toro Meat Market, mural detail, 3171 Cesar Chavez, Los Angeles, 2004, Manuel G. Cruz, artist. 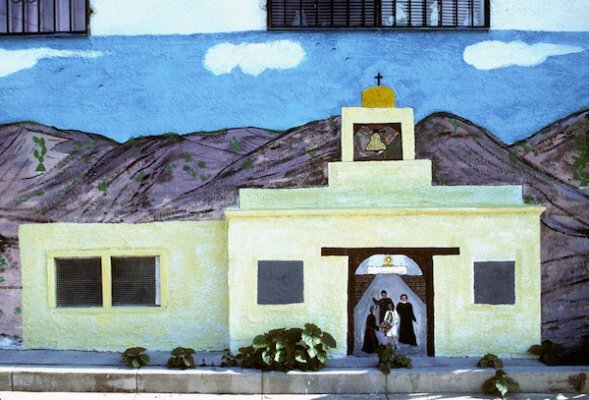 Cruz is an octogenarian who, in his heyday (the ’70s to the ’90s), was a leader among Chicano muralists. He was also the most Mexican in terms of his choice of subject matter. He lovingly depicts an essential world, ignoring the overwhelming presence of America del Norte. His vision is fixed on the monuments of Pre-Columbian times, the conquest, and the Virgin of Guadalupe, ending with the wars and revolutions that took place a century ago. 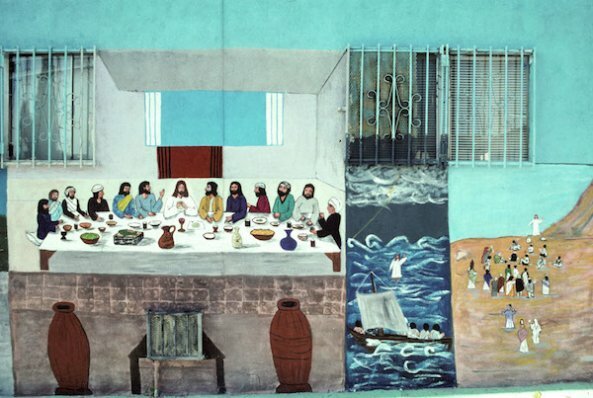 In 1981, he painted an enormous, idiosyncratic mural about the Spanish conquest on the wall of Moctezuma Cafe, across the street from Evergreen Cemetery in Boyle Heights. 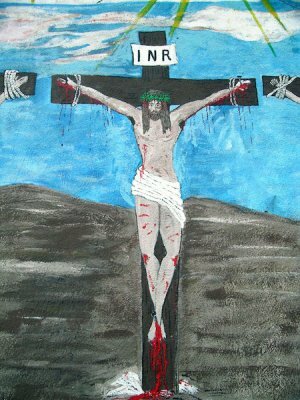 It is not clear where he found the imagery he drew from, but he planted symbols to show the conquistadores as destructive. For example, he included a figure of death speeding toward America on a surfboard as the Spanish soldiers land ashore, a playful touch. 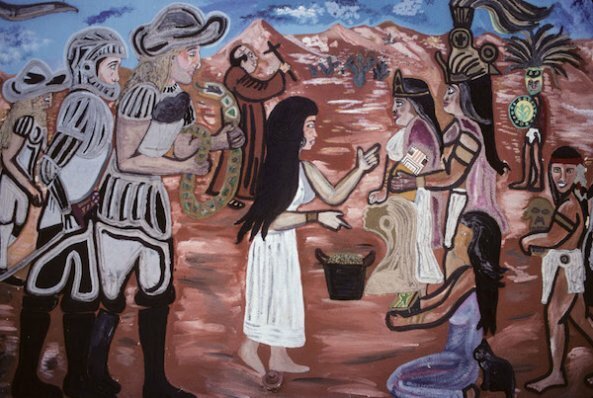 In a scene of encounter between the invading Spaniards and native women, an invader holds a hissing snake. Women are shown as submissive, making offerings. 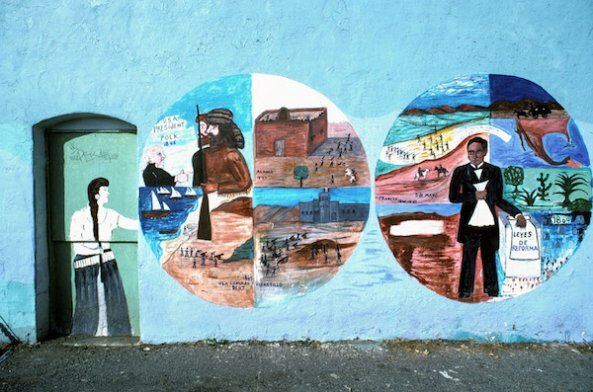 Cruz paints such moments in Mexican history as the carving of the Mayan calendar; the Alamo besieged by tiny, insect-like people; and an elderly Father Miguel Hidalgo y Costilla starting the revolution of 1810, with an enormous revolver in one hand and a painting of the Virgin of Guadalupe in the other. 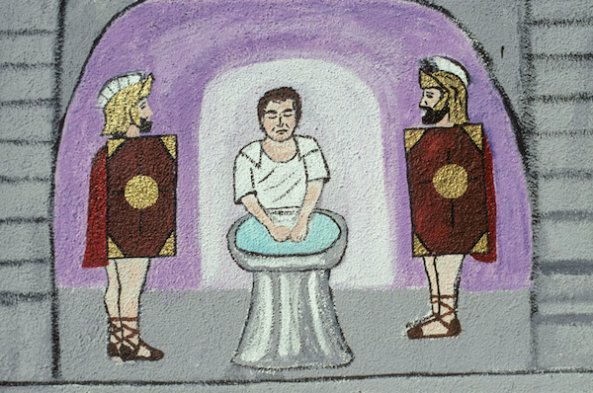 In his narratives, the figures have distinct looks and are fully engaged in fighting, conversing, or listening. Couples look at each other with tenderness. 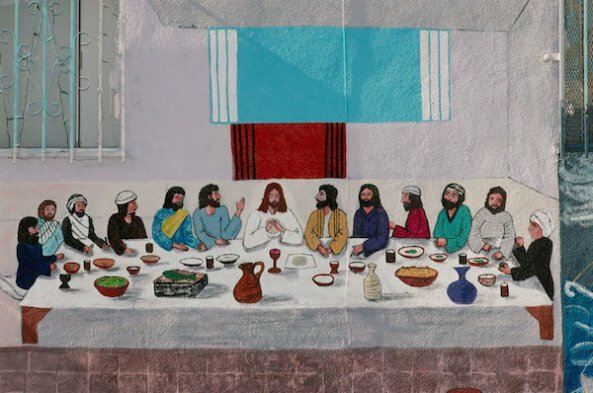 In his Last Supper, the apostles are varied in appearance and gestures. 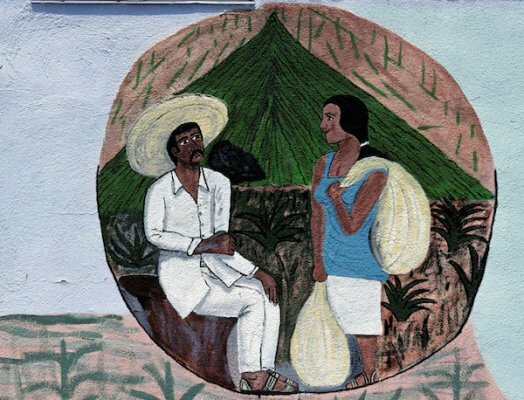 In his storefront murals, people wear fashions as timeless as the brown dirt under their feet. Absent from his art are zoot suiters with their classic cars, low riders, farm workers, gang members, mariachis, or local sports teams. 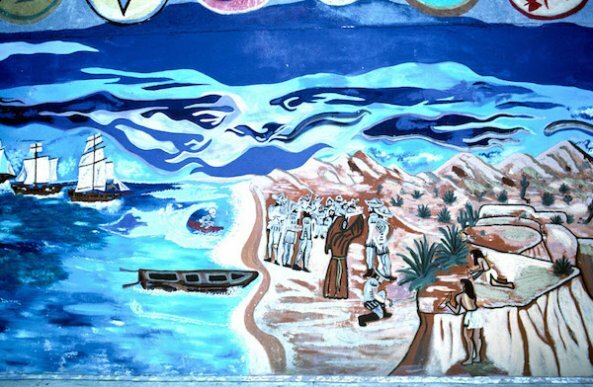 The only reminder of modern California I found in his murals is the crouching skeleton surfing the waves following the conquistadores. I have many questions for Cruz, whom I’ve never met. 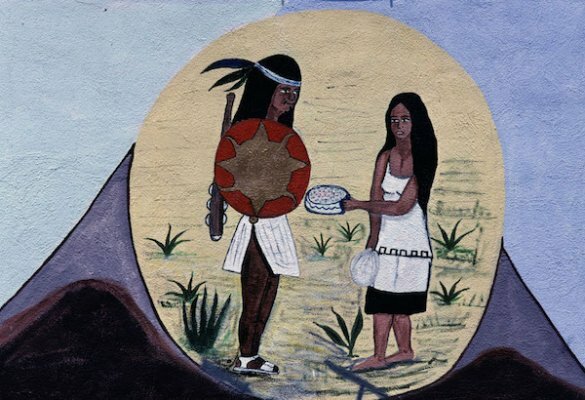 Such as: What drives you to paint traditional Mexico? Why do you ignore present times? Once I went looking for him at his favorite bar, but he was not there. I was told that he slept in his troca, parked on the street. 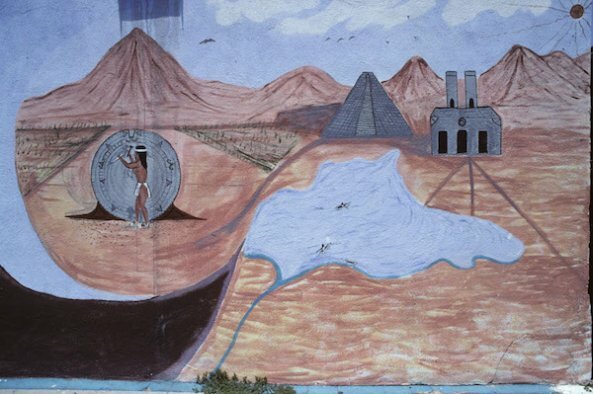 On another occasion two years ago—while looking for him at La Princesita Meat Market on Cesar Chavez Avenue, where he had painted a mural—I learned that he had moved to Calexico. 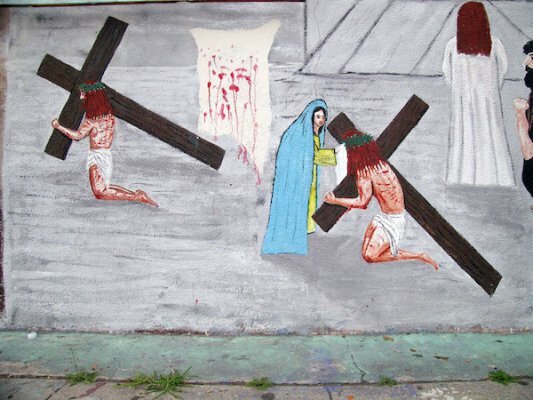 It is a shame that time and vandals are erasing his work. The image of death riding the surfboard has disappeared. And so Manuel G. Cruz remains largely unknown and uncollected. I like his reddish brown California hills, his sense of movement, his passion to record his vision of history and his playfulness as seen in the women’s hats, death on the surfboard, and the arrangement of meats in Princesita Market. The spirit of his images, and the effort that went into them, should not disappear. *Photos courtesy of Camilo José Vergara. Camilo José Vergara is a New York-based sociologist and photographer who photographs the same urban locations over time to document changing communities. His web site is Camilojosevergara.com. 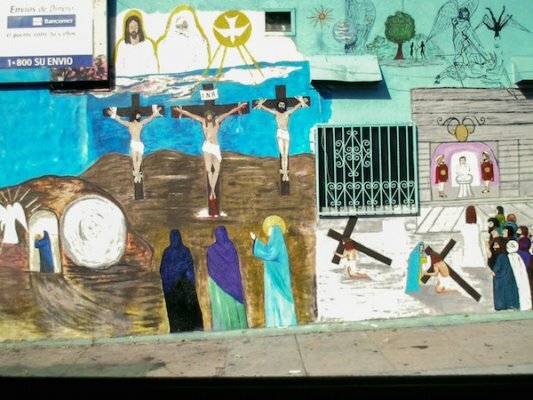 He wrote this for Open Art, a partnership of the Getty and Zócalo Public Square.